If you were to ask someone what they remember most about Freelancers' 1985 show, based on the music of French film composer Michael Colombier, it's likely they would mention the uniform lapel flaps and moving stage risers. The lapel flaps, fashioned with Velcro, magically changed colors throughout the show, while the risers introduced a new element of theatrical staging that well pre-dated similar efforts by other corps by a generation of corps fans. 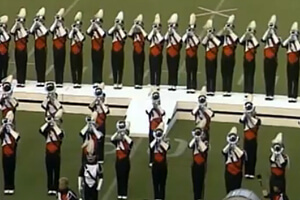 What you saw visually from Blue Stars' use of risers in 2011 no doubt had its genesis in Freelancers' 1985 show. Colombier was a French film score composer whose name was relatively unknown in the United States, despite having been the musical director and arranger for Petula Clark and a recording and business associate of Herb Alpert. He worked with a wide variety of famous pop, rock and jazz artists that left no musical style untouched and won a Grammy for his work on Prince's "Purple Rain" soundtrack. In 1985, Freelancers featured his music in their 12th place program that was coordinated by Frank Dorritie, who had the idea to utilize the oft-moving risers as a visual focus to feature soloists and musical entities thus helping the audience to "see" the music. "Immanuel" started out with many members vocalizing on "ahh" as the brass section introduced a lovely pensive chorale, starting with the horns in the very front of the field, with some atop the risers. The corps barely moved until "The Minotaur" kicked in, a bright and sweltering jazzy work that featured white lapel flaps for the color guard and percussion and red overlays for the horns. During this piece, the six sections of the risers sat on the front sideline. When the corps turned around after the beginning of "The Island," the fronts of the uniforms had become yellow with red overlays. Members of the guard moved the risers and did a short dance on top to the frothy calypso tune. The red overlays disappeared and the fronts of the uniforms were solid yellow. The audience started focusing on the uniforms so as to not miss any changes. The risers were re-assembled in a straight line behind the front ensemble and both snare and tenor drummers climbed atop for a laid-back drum feature that became increasingly rudimental. Now a white flap was draped over the yellow overlays. "The Forest" started out with white over red, those colors appropriate as a visual eye-catcher that anticipated the "Where's Waldo" craze. As the music became more intense, the overlays became solid red for some, with yellow lapels and white lapels for others. The guard spun around and suddenly turned yellow as the music changed demeanors and became mellow. As the show progressed, each section featured its own color scheme. Musically, by far the most memorable selection was "Bells." Interestingly, while the corps' PR materials dealt almost exclusively with the music of Colombier, this piece was written by Ian McDougall, the lead trombonist for Rob McConnell's Boss Brass for 20 years. Metallic keyboard sounds in the pit created the effect of multiple bells ringing forth, like listening to church bells toll from different locations within a village. Featuring an ever-increasing accumulation of soprano bugles atop the risers as more and more horns joined the polyphonic bell sounds—much like the earlier layered metallic sounds, but in brass—this was one of the most jubilant pieces enjoyed on the field that year. This week only, you can save on 1985 World Championship Audio and Video Performance Downloads on the DCI Fan Network. Buy the 1985 Freelancers Video Performance Download. (Available this week only for $3.99. Regular price: $4.99.) Buy the Audio Performance Download bundle of all 12 Finalists from 1985. (Available this week only for $15.99. Regular price: $19.99.) Offer ends Monday, Dec. 12 at 8:30 a.m. ET.